It's been a while since I read this whole series but I marathoned it and loved it so much I knew when I this one came out, I had to pick it up. I still enjoyed it but I think that I have definitely changed my tastes in the last few years and some of the more macho man things Daemon does don't fly as easily with me this time around. I'm back with another book review, today it is Oblivion by Jennifer L. Armentrout. 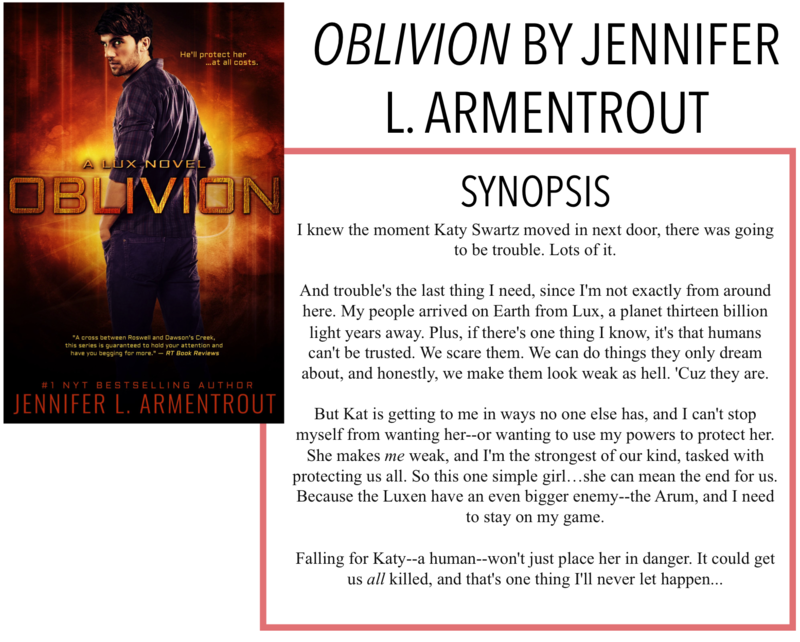 This story follows the same story as the first book in this series, Obsidian, but just told from Daemon's perspective. I won't get into a real synopsis because if you're wanting to read this book, you've probably either read the first book or you've heard of the series before and know what it's about. I was a little worried about this because I didn't want to be bored by essentially re-reading the first book. Luckily for me, it's been a few years so I was feeling more nostalgic than irritated about the re-telling of the story. If you read this one closer on the heels of book one, you might find it a little repetitive. There were some differences in the storyline, just because you see what's happening with Dee and Daemon behind the scenes, but for the most part, the plot is the same. Some of the comments Daemon makes were a little uncalled for and occasionally, bordered on gaslighting. I know he was just trying to convince her things weren't happening because he was trying to keep the whole alien thing a secret, but it was almost at the point where he was trying to convince her she was crazy and imagining things. This obviously happened in the first book as well, and I don't think when I read it then, I was that aware of it, but I definitely wasn't so much a fan of that this time around. Overall, while this book didn't add a lot of new information to the series, it was an interesting read and I enjoyed revisiting some fun stories with characters I liked reading about.